Parent’s Read: Helping Boys Learn - Mamanista! As the mom of two boys, I totally get that boys learn differently from girls. But the extent to just how differently they learn was a bit foreign to me until I started to read “Helping Boys Learn: 6 Secrets for Your Son’s Success in School”. My oldest is very bright (scary smart in that he sometimes outsmarts ME, ugh!) and he does well in school, but he has a short attention span and at home he hates doing his homework. It’s like pulling teeth. Not because he doesn’t know the answers, but simply because he’d rather be doing something else. I picked up this book in hopes that it would help me find some solutions to these issues. I am on the first secret, “Movement”, so I can’t report if any of the techniques have worked but I hope to report back on them! Have you read this book? Has it helped your son? Let me know in the comments section! 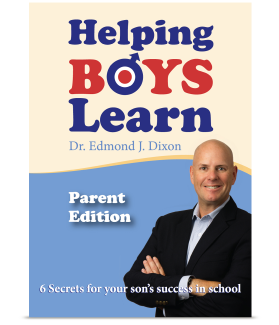 Dr. Edmond J. Dixon is a human development specialist with 30+ years of experience as a teacher, administrator, writer, researcher–and parent of boys! He is the founder of the KEEN Differentiated Learning Group, an organization dedicated to helping struggling learners, and the creator of KEEN 5X, a series of strategies for classroom engagement and learning.